Life reconstruction of the asymmetrically feathered troodontid Jianianhualong tengi DLXH 1218. Credit: Julius T. Csotonyi 2017 / Xu, Currie, Pittman et al. 2017. (Phys.org)—A team of researchers from Hong Kong, China and Canada has identified a new species of Chinese troodontid—an ancient species that sported asymmetric feathers. 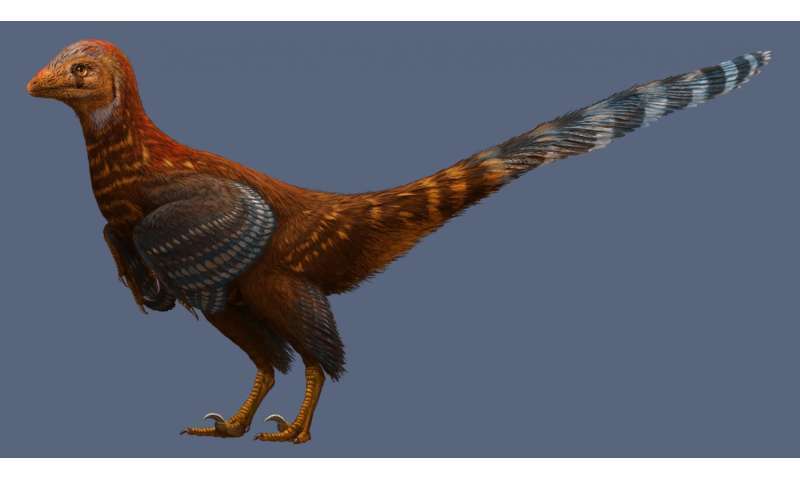 In their paper published in the journal Nature Communications, the team describes the specimen, which has been likened to a giant chicken with teeth, and why they believe the find extends the emergence of a certain trait further back in time. The well-preserved fossilized specimen was found in Lioaning, which is part of an area in China where a lot of other well-preserved fossils have been found in the past. 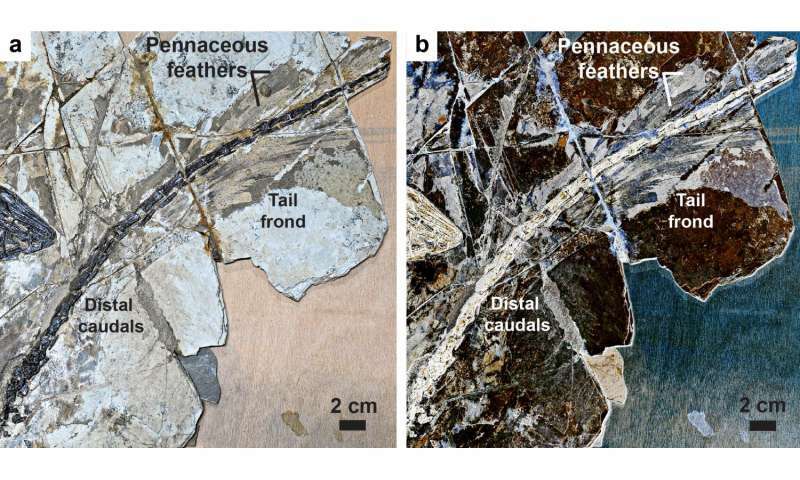 The new species has been dated to approximately 125 million years ago, and has been named Jianianhualong tengi—its defining quality is its asymmetrical feathers, which prior research has suggested is a feature of birds that are able to fly. The fossil remains showed the bird-like dinosaur to be approximately three feet tall and likely covered in plumage. It also had a mouthful of teeth, unlike modern birds. Though very well preserved, it is still not clear if the creature was actually able to fly. Evidence at the dig site showed that the specimen had a long tail with asymmetric feathers, and because of that, the researchers suggest it was likely that it had asymmetrical feathers on its arms and legs, as well. The finding also shed some new light on the development of animal flight from bird-like dinosaurs to creatures that eventually became birds. The specimen has been classified as part of a group called troodontids, which is part of a larger group that also includes birds, both those alive today and those that have gone extinct. The researchers note that the legs and skull of J. tengi resemble those of later troodontids, but its pelvis and arms more closely resemble earlier species, suggesting J. tengi was, perhaps, a bit of an intermediary on the road toward flight. The asymmetrically feathered troodontid Jianianhualong tengi DLXH 1218. (a) Photograph, and (b) line drawing of the fossil specimen. Scale is 50cm. Credit: Xu, Currie, Pittman et al. 2017. The researchers note that what makes the specimen so interesting is both its place in the phylogenetic tree and the asymmetric feathers—together, they suggest the species might be a common ancestor of troodontids and birds, which would mean pushing such a link further back in time. An asymmetrical tail feather from the troodontid Jianianhualong tengi DLXH 1218. (a) Photograph, and (b) line drawing of the fossil feather. Scale is 2cm. Credit: Xu, Currie, Pittman et al. 2017. The tail frond of the troodontid Jianianhualong tengi DLXH 1218. (a) Photograph, and (b) laser-stimulated fluorescence [LSF] image of the fossil tail frond. Scale is 2cm. Credit. Xu, Currie, Pittman et al. 2017. Asymmetrical feathers have been associated with flight capability but are also found in species that do not fly, and their appearance was a major event in feather evolution. Among non-avialan theropods, they are only known in microraptorine dromaeosaurids. Here we report a new troodontid, Jianianhualong tengi gen. et sp. 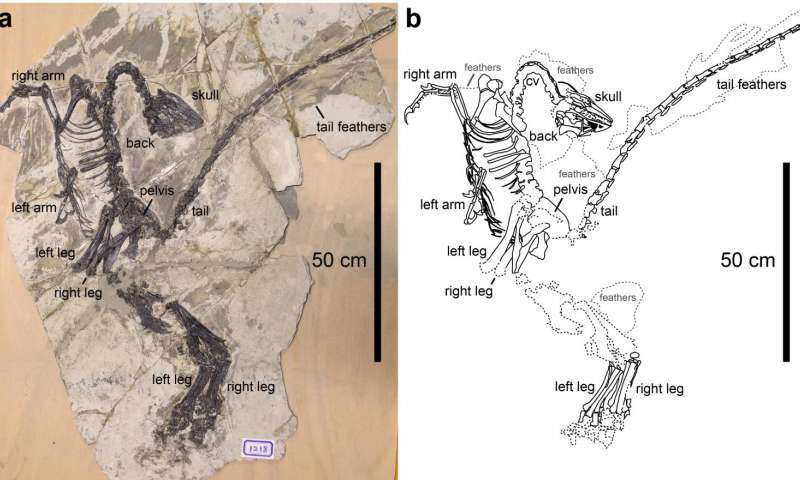 nov., from the Lower Cretaceous Jehol Group of China, that has anatomical features that are transitional between long-armed basal troodontids and derived short-armed ones, shedding new light on troodontid character evolution. It indicates that troodontid feathering is similar to Archaeopteryx in having large arm and leg feathers as well as frond-like tail feathering, confirming that these feathering characteristics were widely present among basal paravians. 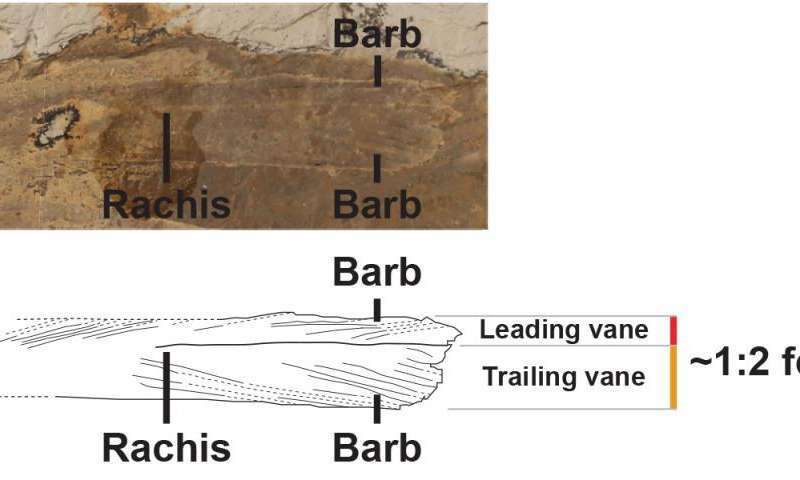 Most significantly, the taxon has the earliest known asymmetrical troodontid feathers, suggesting that feather asymmetry was ancestral to Paraves. This taxon also displays a mosaic distribution of characters like Sinusonasus, another troodontid with transitional anatomical features.